(Miami, Florida) November 25, 2014— A.J. 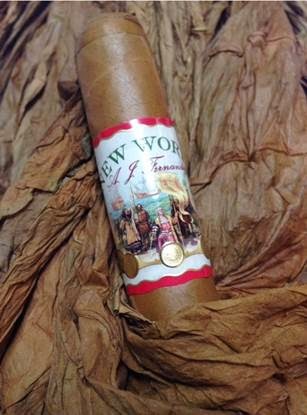 Fernandez Cigars, known for producing consistently highly rated cigars will introduce a limited batch of New World Connecticut cigars for a one-night only sit down dinner event taking place at the world famous “Cigar Inn” located in New York City. Event will take place on Monday, December 1, 2014 at Cigar Inn located at 1016 2nd Ave. NY, NY 10022. New World which was collaboration between A.J. Fernandez and father Ismael Fernandez has been received with rave reviews. To celebrate the success of New World, A.J. Fernandez Cigars and Cigar Inn will partner for a limited seating dinner event featuring a course meal by Rothmann’s Steakhouse. The exclusive event will also feature a premium whiskey pairing hosted by Gentlemen’s Jack to introduce the unveiling of the New World Connecticut. Cigar Inn is one of the most notable cigar shops in the nation and boasts the only Cigar Aficionado endorsed cigar lounge. Billy Sakih, owner of The Cigar Inn, said: “A.J. Fernandez is one of the most talent cigar blenders on the scene today and we are looking forward to offering our guests this event which will feature amazing food, drink, company and the chance to enjoy the New World Connecticut. For More information or to reserve your seat for this event please call Cigar Inn @ 212.717.7403 or 212.750.0809. A.J. Fernandez Cigars is based on the rich tradition of the Fernandez cigar legacy. A.J. Fernandez now produces unparalleled, hand-rolled cigars in Estelí, Nicaragua which have garnered numerous top ratings and acclaim from cigar publications and consumers alike. Today A.J. Fernandez continues the family tradition as he oversees production and manages day to day operations in his factory in Estelí. For media inquiries please contact Creativas Group Public Relations via: info@creativasgroup.com. Death Wish Coffee, The World's Strongest Coffee? How Many Cigars Will This Humidor Really Hold.